Don’t you love decorating for Christmas? And how much fun is it to create something beautiful in about 10 minutes? 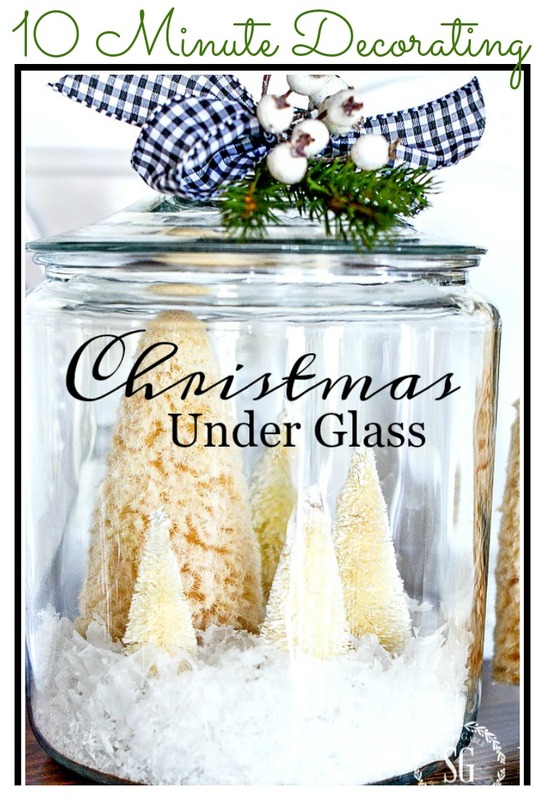 Today I’m sharing Christmas Under Glass! But it’s more of an idea to spark your own creativity and get you thinking about what you have in your own home that you could use to make a very special and very beautiful one-of-a-kind Christmas arrangement! Let’s get started! It’s 10 MINUTE DECORATING… the Christmas edition! A little disclaimer before we begin… it is insanely hard to take pictures of something glass, let alone something inside of glass! And this 10 minute Christmas decoration looks really much more beautiful in real life. I want this post to encourage you to grab anything glass, like a glass canister like I have here, or a cloche or a cake stand with a glass lid. You can even turn a large wine glass upside-down on a plate and create a pretty little Christmas arrangement. I used snow filler in my glass jar and added little bottle brush trees for something Christmassy. 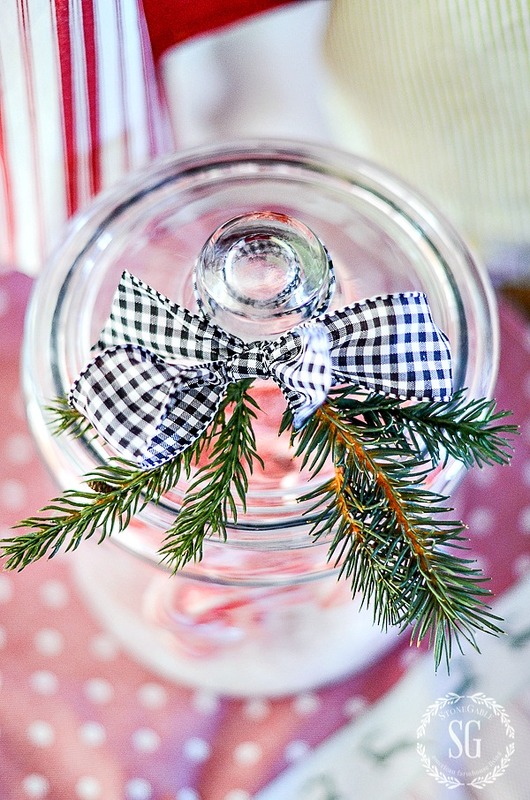 I tied a black and white checked bow to the lid of the jar and added a sprig of greenery and some white berries. So the decoration did not stand alone, and this is VERY important, I repeated some of the same elements outside of the jar. This will pull the whole thing together! I can think of a hundred ways to use a glass dome or canister! How about adding Christmas lights as filler and ornaments as something Christmassy! I used the same formula and added candy canes to a glass container! 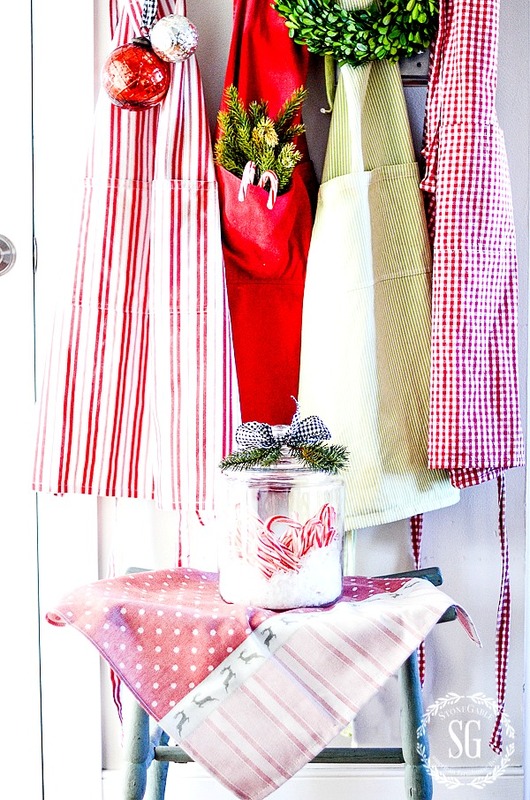 The red and white of the aprons and the candy canes in the pocket of the red apron repeated the elements! I think a few nativity pieces would be beautiful under glass! I hope this post has inspired you to create your own 10 Minute Christmas Under Glass! Now, please check out these other 10 Minute Christmas Decorations! You might like to follow me on Pinterest and see what I am finding to pin every day HERE! Luv your blog and enjoy receiving your emails. You are so inspiring that I cannot keep up with all of the projects I would like to do! I am in love with the Christmas under glass project! This will make a great gift idea for co-workers next year and there are limitless possibilities. What brand of snow did you use? All I could find this year looks like cellophane chopped up and it sticks to everything. I love those super large mason jars I seen. I couldn’t find a small truck hauling a tree-love them, so I bought a small die cast pick up and used red nail polish to paint it. After several coats I glued a teeny tiny bottle brush tree in the back. I could see that in a field of green flocked trees similar to yours and I have some really small deer from ages ago. If only I could find a fox. I would definitely put some battery operated lights on a timer toward the back for some twinkle. Maybe a snowman if I could find one the right size. Just adorable. It’s pretty and flaky and looks fluffy! I scoop it up after Christmas and use it from year to year. P.S. Your snow looks like flaked coconut-I may have to use that in a pinch but would rather bake a coconut cake or coconut custard pie with it. When getting ready to decorate for the holidays, I discarded the half dead plants in my terrarium with plans to re-do in the new year. Instead of storing this piece I decided to decorate it. I could not find bottle brush trees at first so settled for a silver and gold little tree and added the bottle brush trees a bit later. I added a tiny Mr and Mrs. Claus and a a tiny reindeer and sleigh decoration. I then added this piece to my dough bowl with greens and a candle holder to finish it off. Looking at the lovely arrangements in this site has given me a lot of inspiration. I’m not very crafty nor creative…these simply ideas help me decorate a little here and a little there and the total look gets so many compliments! Thank you. I’m so glad you think you can do this pretty 10 minuted decoration! I’d love you to send me a picture of what you do! Please tell me what you used for snow in this lovely project. I can’t find anything similar. I love the quick decorating ideas. Big Bang for the time spent. Thank YOU for sharing. Sometimes the simplest touches make the biggest impact. 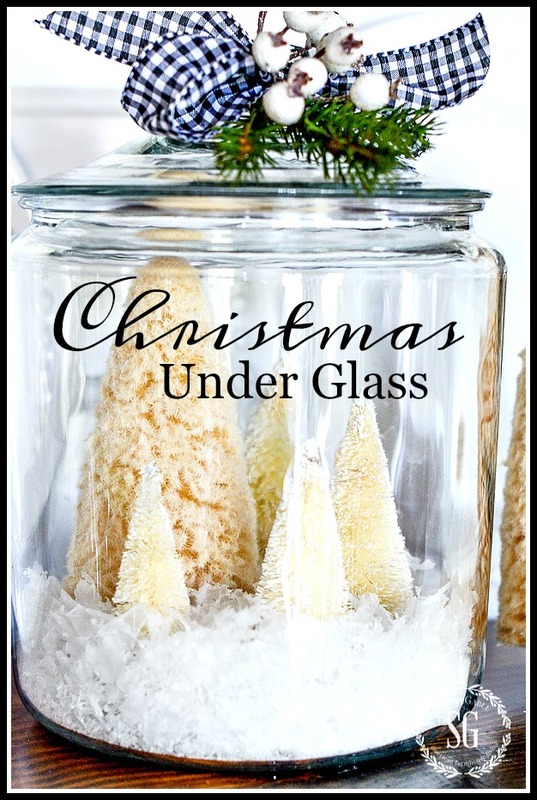 I love the Christmas Under Glass ideas and suggestions. I love this Christmas under glass! I will be saving for next year even though I have all the ingredients. We are in the middle of a major move! Thanks! Wow, in the middle of Christmas! Congrats on your new digs! I have put ornaments or vintage cookie cutters in a glass jar in the past, but I don’t remember them looking quite so pretty as yours! I think I need to up my game with a topper. I love the Christmas underglass. It is so easy to do and looks lovely. Certainly this will be in my Christmas vingette. Merry Christmas to you. I have passed up some covered glass pieces at Goodwill and could kick myself for not getting them. I will keep my eyes open now and scoop up a few. Love the red aprons with the candy canes and the idea of putting a little creche under a dome is so cool! Thanks again for some wonderful ideas!! I simply love the Christmas scene in the large glass jar – so fast and so beautiful! I immediately realized this would be a wonderful, simple activity to do with young children, albeit with a few forest animals thrown in for fun. Wow what an easy but BEAUTIFUL idea! I love it and know it’s something I can do. Thank you! Tis beautiful my friend!! I took a small glass pitcher, filled with fake snow and placed a snowman ornament in it…….love the look! Have done this with candles already in larger glass containers. Never enough glass containers with snow and something special in them! Thank you for a beautiful, peaceful look!! 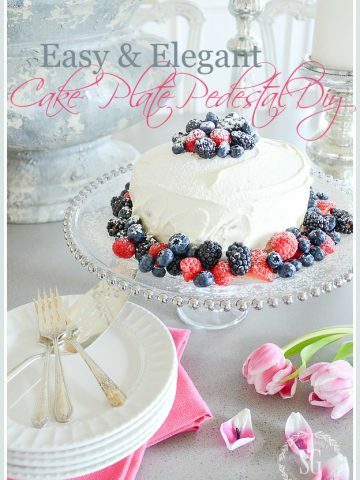 I’m running right now to find my lidded cake stand from Pioneer Woman to decorate! Thank you for another beautiful decorating idea. Yvonne, you always inspire me with your creativity! Can’t wait to try these ideas! 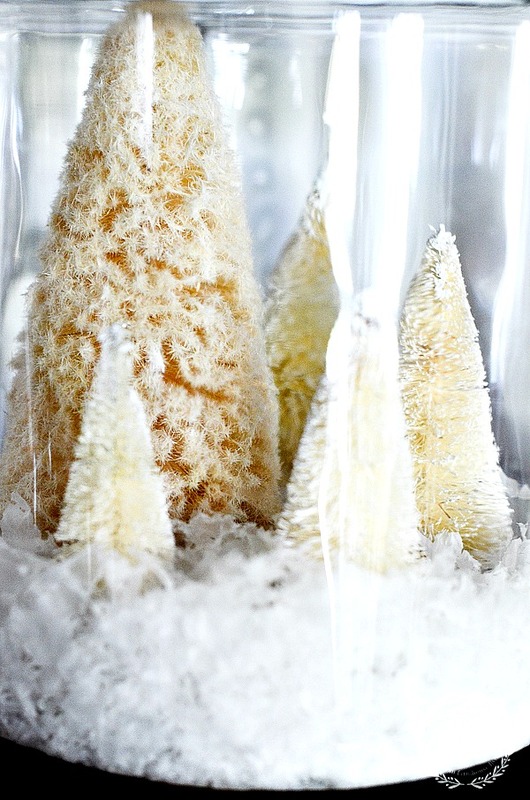 I love Christmas under glass especially with my vintage bottle brush trees. I can’t wait to get started. So many ideas are going through my head of what to put under glass! You always inspire me! Thank you for the idea using glass canisters with Christmasy decorations. I think my Dickens Village pieces could work well too. Going to do this today. I have been wanting to change my Christmas decor and your ideas are splendid!! Love the colors and combinations! Also, love the comments to simplify the Christmas season. Looking forward to more ideas. Thanks! I’ve been thinking I would use my glass canisters for something this season. Thanks for the inspiration – I especially like the candy canes. I love all the little figures under glass in the snow. I’m going to go look for something you use. Love your blog. I love to decorate and have been collecting nature and appreciate your ideas! That will look so festive to all your backdoor friends! I loved the Christmas under the glass. I am going to make some for gifts. I am also glad I found the Autumn Cottage Journal. I love the aprons with just a bit of greenery tucked in. your blog has great decorating inspirations! I love this, simple and elegant. Thanks for the reminder that less is more. What a gorgeous idea Yvonne!! I love those white bottle brush trees – they are so adorable! I love how you dressed up the top of the jar too with a little bit of holiday cheer!! Happy holidays sweet friend!! I just found your amazing site and I am enjoying all of it! HI GIORGIA! Welcome to the StoneGable family! We are so happy you found us! I always love your touches of the black and white plaid ribbon! You have rubbed off on me! I did a couple of things under glass, also: Simply put a bit of white in 2 apothecary jars, added a snowman in one and a nutcracker in the other and put them in amongst my candy jars. Very cute! I love your arrangements! Love the jar display! Next year! From your inspiration of glass jars, I copied the one with the candy canes. Then I took a glass lantern, with snow in the bottom I added a deer with a red bird on his ear( a Hallmark find several years ago) and a couple of bottle brush trees. Thanks for a quick but so cute idea! Yvonne, the grandchildren and I made these last year at Christmas and then this summer when they were visiting, we called them Christmas in a Jar. The whole process was fun, we went to Hobby Lobby and Goodwill so they could find just the right jars, figurines, etc. not only something pretty to look at, but a great memory of time together crafting! One day before you know it, you will be doing something like this with your grands! Lovely! I did something similar last year. There was an extra cloche that I had no plan for so I put one of the old putz(?) houses under it and it just sparkled so! Thank you always for sharing your beautiful home, your ideas and everything else!! Happy Holidays! These pictures make me want to sit on the stool grab a cookie and a mug of coffee and sit with you to visit all afternoon. This is exactly what I want for my own kitchen. Love it all! Love your snowy Christmas tree scene in the glass jar – so pretty and so simple! Thanks for sharing…. Happy Weekend! I love your style of arranging little beauties! Cute!! Simple! We can make things so complicated at times, can’t we? I have a biscuit jar with vintage ornaments and faux snow. Simple, yet pretty and festive! 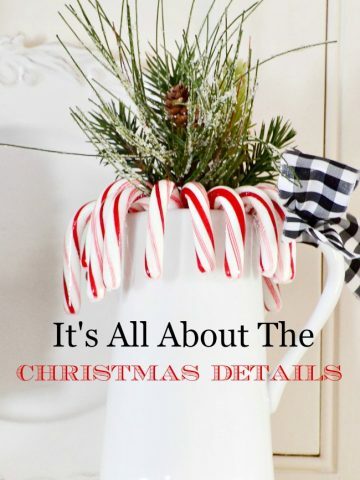 Candy canes, bottle brush trees, and glass containers are some of my favorite decorating pieces, but your combinations are stunningly simple. Thank you so much for sharing! I love those little white bottle brush trees. I have been collecting the little green ones, but don’t have any white ones yet. I’ve been trying to fill a cloche with little ornament balls and the fairy lites, but I can’t keep everything from just falling to the bottom in a heap when I set the cloche upright. I think maybe I need more balls and lights, not sure. I went back and read your post from 2013 with the 10 things to prepare for next year’s Christmas. Really good suggestions! I am anxious to get started! Not anxious for Christmas to come faster, though, as I still have a LOT to do THIS year! Just want to say a BIG “Thank You” for all your hard work!! You never fail to come up with a post that is so pretty & yet practical! Love your blog! Love this idea! Of course, I gave my jars to my sons when they moved into apartments. Love this idea! I’m going to do some mods to it for my Wee Abode! 🙂 Thanks, Yvonne! Another great idea! I’ve got an antiques cake stand to use as base, and I’ll find a glass jar to use as a cloche! I love it! I have a few Christmas cloches but I haven’t tried jars yet. Love this ideas and we can use little ornaments that we have and I like the “snow” too that I use it every year. Thank you. One question. How do you get the little trees to stand up without tipping over? Secret? I just bought some $1 bottle brush trees at Walmart today and I have a glass jar already, so I am going to do this for sure! Time to get out the glass. Beauty in a jar! Collecting jars for this type of easy project will bring smiles from all! Candles work well in jars too. Loved the idea and made mine with a tiny set of led lights…so pretty! This year I’ve done this with a cloche. I have artificial snow in bottom with paper house with red and silver glitter and then tied on top with red ribbon and bow to finish. Love the simplicity of your ideas! Anyone could put these together and make things pretty! Thanks and God bless you! These are so pretty, love those trees with the snow! Love it! I like using cloches too! Sooo cute! Obsessed with Bottle Brush trees this year! From my Pottery Barn pillow (red truck hauling Christmas tree home), to metal toy cars tied with bottle brush trees on top, to the kitchen where I used a cake stand with a clear domed cover to plant bottle brush trees and gingerbread houses that light up at night! So enjoy your site and tips! Just the way to display my antique china snow babies. Each year I worry about them being handled and broken, but this will prevent that. Thanks! You know what you do that I love? You add pretty little ribbon to so many things. It makes all the difference in the world. This is a lovely project but it wouldn’t be the same without that splash of black and white gingham and the little berries. It’s beautiful. Now I know what to do with all of the glass containers. I’m tired of filling them with small ball ornaments. As always, thanks for some truly simple, easy beautiful decorations. I have been doing this for a long time. Anytime you put something under or inside glass it elevates it to a whole other level. Another decorating trick is to elevate your object to give it a more commanding presence. 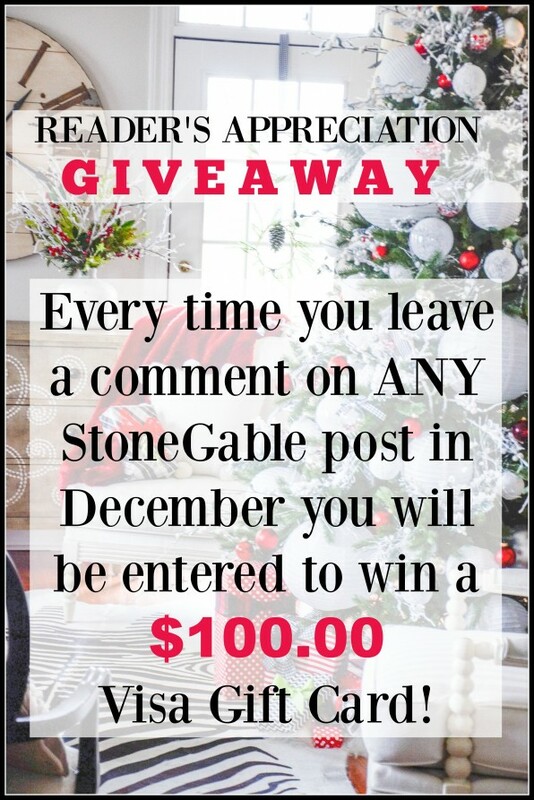 Love StoneGable and all of your ideas. Blessings to you and your family this Christmas Season. You already have your best gift…your new grandson. What a lovely idea! I am for anything that takes 10 minutes to decorate!! Great idea!! Where do you find those pretty white trees? I especially love the texture of the large ones!!! Everything looks special under glass. I have a couple of cloches that I use to elevate littles. At the moment, I have the cutest snowman, not very big, that when under a cloche says ” Look at me!”. Love your idea, Yvonne. I absolutely love the simplicity of this idea! And I even have some ornaments that would make a fantastic Christmas Under Glass arrangements! Thank you for sharing! How pretty and sweet Yvonne! Thank you. Yvonne, I am in love with bottle brush trees! Thanks for the wonderful ideas you post. I’ve been unable to find wired black and white check ribbon. Would you share where you got yours? Such wonderful ideas!! Thank you for your inspiration!! Super cute and so easy. So ce! Love the 10 minute decorating. Love your idea. I just got some bottle brush trees and was wondering how to display them. Now I just need to find a glass container. I love the look with the candy canes under glass too. Great quick ideas with big impact. Such a cute and easy to make idea! Thank you! Every day it seems like I want to run to the store to try one of your ideas. They all look amazing! Thank you so much for all your wonderful ideas and spiritual insight. We all need to remember the Reason for the Season. Thank you! I have done something similar in my home using glass jars from salsa and pizza sauce. I added snow and candles and tied ribbon around the jar. They turned out really cute! Love the Christmas trees “under glass”. I have a thing for little groups of trees sort of scattered about the house. It can be one or several grouped together. I especially love the bottle brush trees but even the styrofoam trees covered with bunched up coffee filters make a really cute pop in an otherwise blank area. I love the look of simplicity. Less is truly more. LOVE LOVE your site and look almost everyday to see what is new! I do this with cute food jars I save for just such things and my 3 y/o grandson has one I made him, he loves to carry it around and love on it. He’s fascinated with it so…..the tree is no longer straight and some days my daughter finds it upside down but for pennies it was well worth it and he had his own Christmas tree with snow! Beautiful!! A story in a jar!! How cute! I can hardly wait to try my hand at this simple christmas decorating idea. Thanks Yvonne and have a great day! You have some really cute ideas.. I really like it when you can something like this simple glass jar and get so many different looks, not just at Christmas, but throughout the year! Elegant and simple, that’s my kind of project! Love this idea. This time next year we hope to be in a new house. I can’t pin ideas fast enough……. Thanks for all the wonderful ideas. A question. You must have some decorations or special items that have a family history to them that you use every year. How do you work them into the displays that you change around from year to year? Another great decorating idea. My house will look awesome by the time Christmas rolls around! This looks so pretty… all bright and sparkling ! 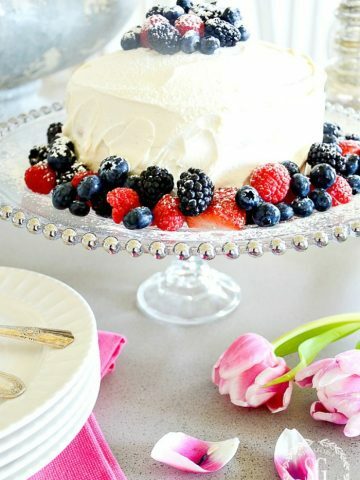 Another simple yet elegant idea! Thanks so much for the great inspiration. I love those glass jars, I use them all over my kitchen all year long! I keep my dog’s treats in one, and I have a set of them that holds my flour, sugar, brown sugar, and granola (with a cute tea cup inside for dipping – that was inspired by you!) 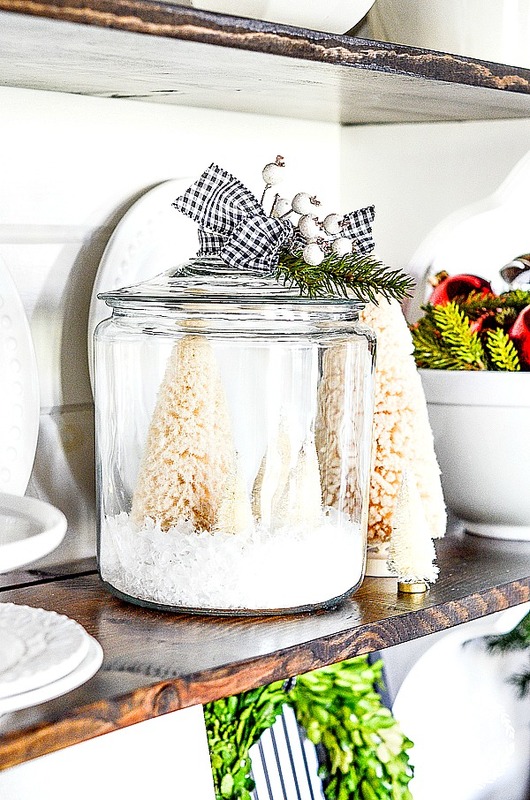 These jars are so easy to decorate with, and look super cute spruced up for Christmas! I love to tie ribbons around the handle, it looks so cute. Thank you for these quick & easy Christmas ideas! Great idea and the possibilities are endless when it comes to what to put under glass. Thanks so much for prodding my creativity . . . which is sometimes asleep!! No matter how simple the decoration you offer it always looks professional. Adaptable to any size container I’ve notice the popularity of bottle brush Christmas trees and I’m fascinated with the different colors they come in. Beautiful idea. Your site is dependable one-stop shopping for inspiration. Thank you, Yvonne! You can make anything work and look beautiful. Love your creativity. Good idea for hostess gifts. Simple and beautiful. How cute! I love it and I need easy cuz I don’t have a lot of Christmas stuff in the house. Love your tips. Love this…simple but elegant!! I need to find the snow filler in my area. I always enjoy seeing your great ideas! Yvonne, I use cooper cookie cutters, trees, and tiny kids on sleds (purchased at Joanne’s) in a kitchen jar. I trade out the star cookie cutters for cooper hearts at Valentine’s Day. I keep this going until Spring. Kelly at TALK OF THE HOUSE has gingerbread houses in her jar. Also, Epson Salts works great in these jars and is very inexpensive. They make lovely tiny gifts in jars for shut ins. The biggest jar is available for $13 at TARGET. I store mine from year to year. Don’t forget to begin forcing paper whites. Thanks for being here each day! Love the cuteness of it! Love this idea and the added tip on repeating the idea outside of the jar. What a difference this one little tip makes! Easy peezy that is what I need this time of year. It is pretty and will add Christmas cheer in the home. I love decorating with glass domes and containers! Thanks so much for your beautiful creations. 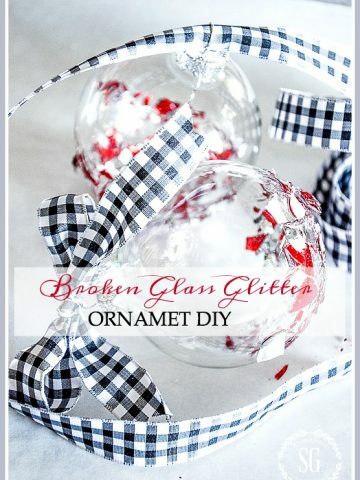 A great tutorial that shows an easy way to add a little Christmas sparkle! Man I am kicking myself right now…at my target yesterday they had those same glass canisters on sale for $2 for the gallon size & $1 for the half gallon because they had a chip in the rim. I didn’t need any so I thought! Looks like I will be making a trip back this morning. I love how simple the trees and “snow” look but the bow with a sprig of greenery gives it that little something extra! Hurry back today and pick them up! They can be used for decorating beyond Christmas! Love your ten minute decorating ideas. I’m so glad you are enjoying them Cindy! Me too! You give me such inspiration.